This post is sponsored by Plaid Crafts and Martha Stewart Crafts. All opinions are my own. One of my favorite Christmas movies is "Elf". If you haven't seen it yet, be sure to put it on your list. 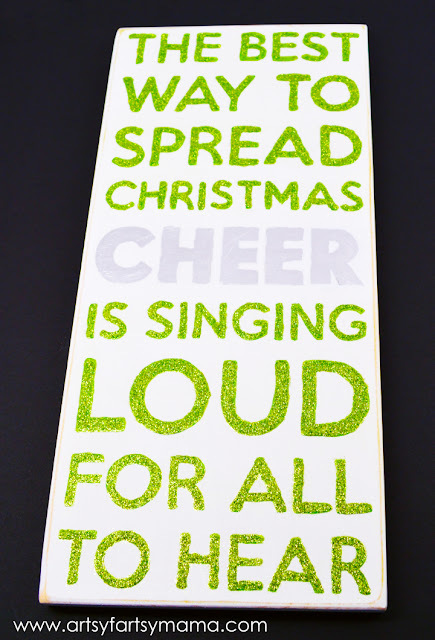 It have many memorable quotes, one that I really love is "The best way to spread Christmas cheer, is singing loud for all to hear"! It is just perfect for using for holiday decor, don't you think? 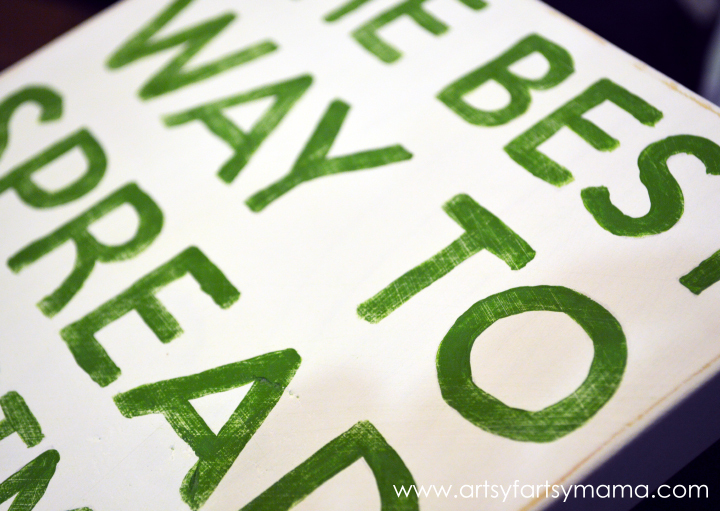 I decided to put the quote on a wooden board using Martha Stewart Craft supplies. I also used a new technique that I'm pretty thrilled about. You can get the Martha Stewart Crafts line in-store at Michaels or in Plaid’s online store. We cut a 1'x8" pine board to about 15 3/4" long and sanded it smooth. 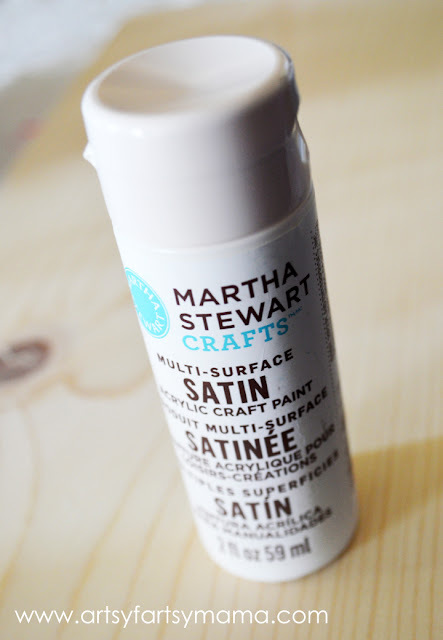 Next, I painted a base coat of Martha Stewart Crafts Satin Acrylic Craft Paint in Wedding Cake. I ended up needing about 3 coats to completely cover the board. Let dry completely between coats. I painted the last coat in a different direction, and I love the canvas-type look it gave the board when I sanded it after the paint dried. I didn't want to cut out stencils for this project mostly because I had some small letters to work with, and I didn't want to deal with all the smaller pieces (like the insides of As, Rs, etc). So, I transferred the wording over to the board the old fashioned way: using pencil lead to work kind of like a carbon copy. First, arrange your sign wording on the computer and print. Color on the back side of the paper with a pencil with a good amount of pressure. 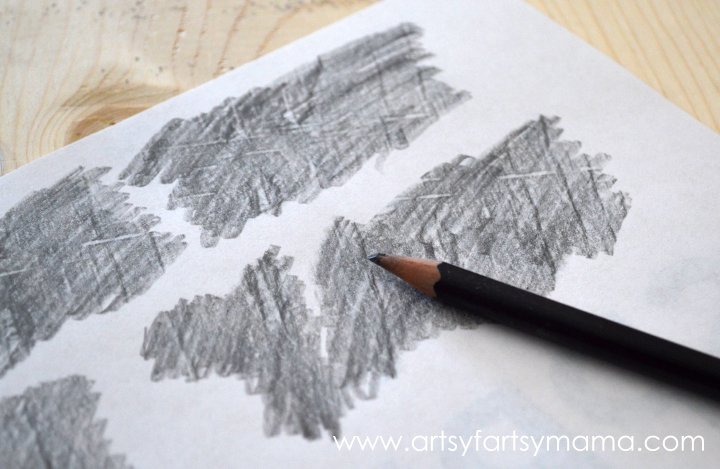 The more pencil lead you get on the paper, the darker your transfer will be. Turn the paper over on the board and make sure it's aligned. 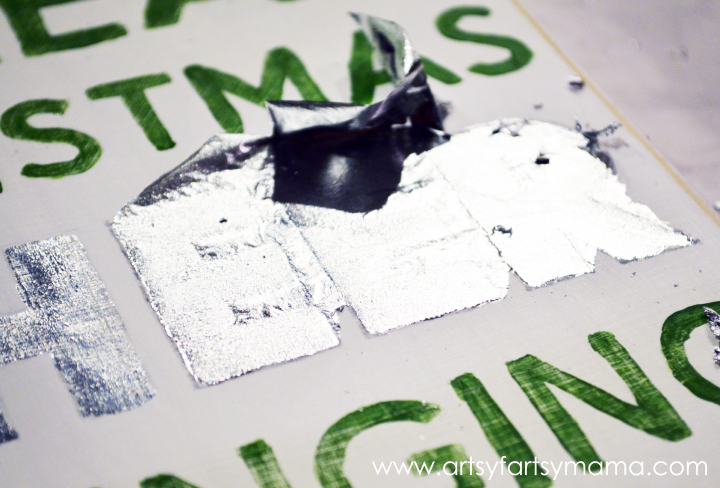 Tape the edges into place, and carefully and SLOWLY trace the letters. Just like your scribbles on the back, the harder the pressure, the darker your transfer will be. DO NOT move the paper until you are finished tracing. You will have light edges of all your lettering as a guide to hand paint the sign. Using a small brush and some Martha Stewart Crafts Satin Acrylic Craft Paint in Scottish Highlands, I finally got all the lettering done on the sign. Since I wasn't using a stencil, and I'm certainly not perfect, a lot of the letter edges aren't even. I went over the letters again with paint for a more even coat, but they still looked a little off. So, I took a chance and sanded the letters to give them a worn look, hoping that maybe that will distract from the letters not looking so clean. It also showed some of the canvas texture through the letters. 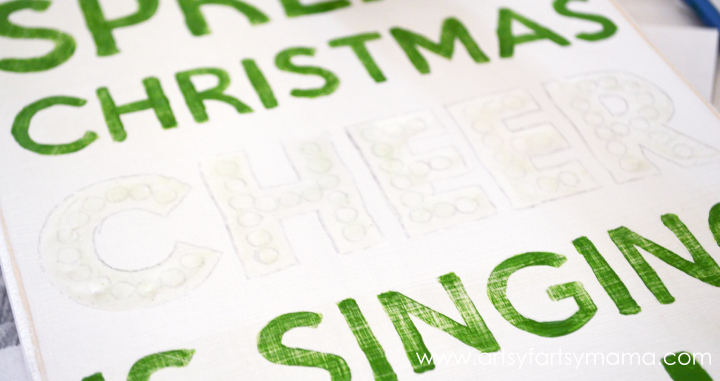 I wanted the word "cheer" to stand out, so I decided to try Martha Stewart Crafts gilding set for the first time. I was a bit (a lot) nervous to try it, but I read instructions on the packaging and Plaid also had some FAQs on their site that were very helpful. 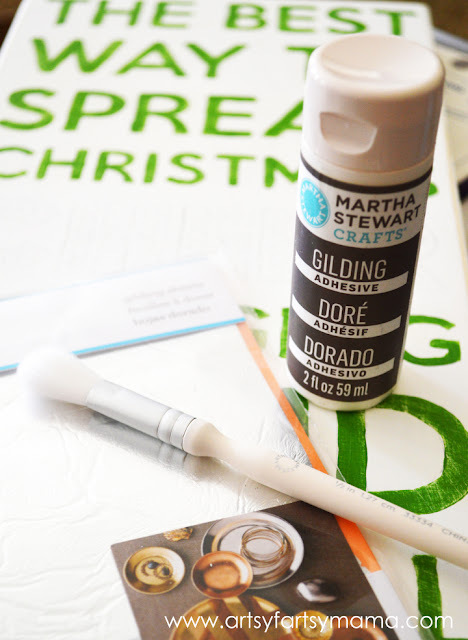 For gilding, you'll need Martha Stewart Crafts Gilding Adhesive, Gilding Sheets, Gilding Brushes, and there are also Gilding Gloves to make it easier to handle the delicate gilding sheets. Make sure the area you are covering is clear of dust, and debris. Paint a thin coat of the gilding adhesive in the area you want covered (I'm covering the letters - ignore the polka dots...). Let the adhesive air dry for a few minutes until it becomes tacky. If it's not completely dried, you'll run into problems. When the adhesive is ready, carefully lay the gilding sheet over the area with the wax sheet up towards you. Press and smooth the gilding sheet to the board, rubbing gently. Repeat the process with a new sheet or turn if one sheet doesn't cover the whole area (like the "R" above). 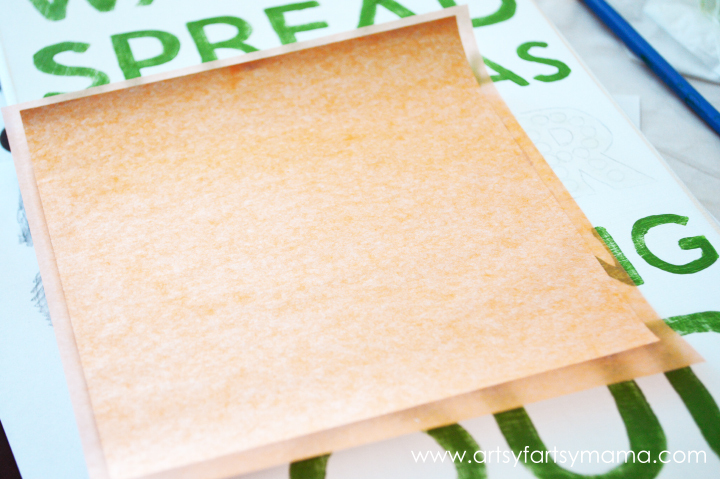 Peel the sheet up to see your new gilded lettering! Using the gilding brush, brush over the letters to remove the excess gilding. Remember that part about making sure that the adhesive is dry enough? This is what happens if it's not dry... it's a mess and it looks awful. Don't worry though - I learned a few tricks on how to fix it if you have a fail like I did! The adhesive is super sticky and doesn't sand off very well. Luckily, we found that the adhesive is water-based, and with a little work, was able to get the messed up letters off using a baby wipe (love those things!). Once everything was clean again, I did need to re-transfer the lettering. I repeated the gilding steps - making sure the adhesive was at the right dryness before adding the gilding sheet. It worked perfectly this time! I brushed off all the excess gilding, and added some white paint touch-ups to some of the areas that needed some help. When in doubt, add glitter! I decided to paint over each letter with Martha Stewart Crafts Decoupage, then sprinkle extra fine green glitter over top. I glittered one row at a time, then tapped it off onto a scrap piece of paper. Stand the board on a shelf or mantel, or attach a sawtooth hanger on the back to hang on the wall. For more Martha Stewart Craft inspiration, be sure to follow on Facebook, Email Newsletter, or Plaid’s Martha Stewart Crafts Pinterest board. Fun! I can't wait to play with the gilding. I also agree, when in doubt, glitter makes everything better!!! This is so fun! Elf is my all time favorite movie! Great sign - I love this quote and movie! Plus, glitter. Enough said. So cute and great tutorial. The glitter is fun too. Nice job. I love the glitter and the gilding! 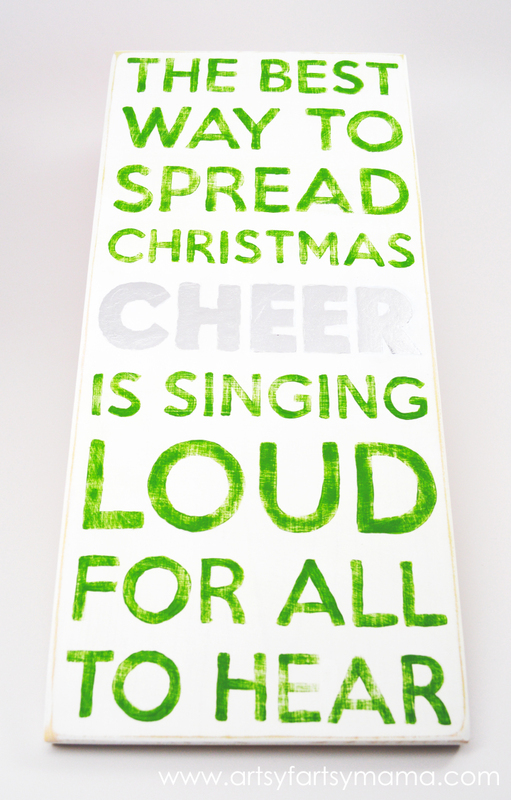 And you can't go wrong with a quote from ELF. I can't wait to watch it this year. This saying is simply beautiful! Well done! That is the best, we love Elf!! I totally need to use this line this year! I love this!!! Elf is one of our favorite movies ever! (I actually just watched it a few weeks ago - like, before Halloween. Shhh...) Awesome sign! I LOVE Elf! 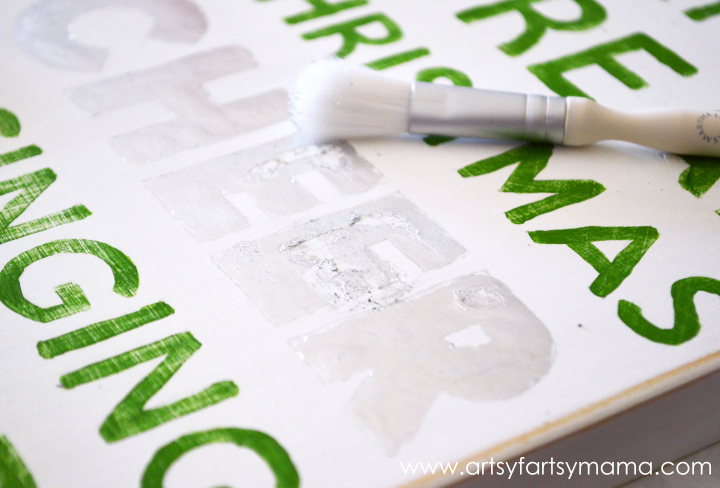 This is such a fun craft and turned out awesome - love it! LOVE this! So fun and so cute! What an honest post! Thank you for bringing us through your creative process, including the bumps along the way. What an honest post. Thanks for taking us through your creative process, including the bumps and blips along the way! My, I never thought about transferring like that!